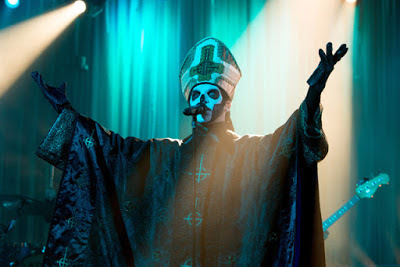 Ghost founder and frontman Tobias Forge, aka Papa Emeritus, has filed a response to a lawsuit brought by four former members of the group in a dispute over financial issues. In the character of Papa, Forge leads the Swedish outfit alongside a rotating band of Nameless Ghouls, some of whom revealed their identities in the suit filed earlier this year in a district court of Linköping, Sweden. Simon Soderberg (Ghost member 2010-2016), Mauro Rubino (member 2011-2016), Henrik Palm (member 2015-2016) and Martin Hjertstedt (2014-2016) are seeking compensation for unpaid wages as part of what they claim to be a business partnership agreement between all five parties.. The four musicians are asking the court to have Forge confirm and provide Ghost revenue reports from the financial years from 2011-2016, with a penalty of SEK 200,000 (approximately $22,000), or an amount that the court considers reasonable, if he fails to do so as part of the proceedings. An English-language translation of Forge’s full response can be read as posted via Reddit here and here. The former Ghost members reportedly parted ways with Forge following their 2016 tour. Ghost are currently playing dates with Iron Maiden on that band’s summer tour of North America.